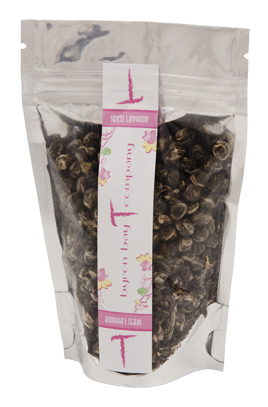 Buddha’s tears roll tenderly from the tea plant; made with the bud and first two leaves. Carefully plucked and hand-crafted into tiny pearls, they are then scented with fresh jasmine blossoms. Once removed from their floral cocoon, the tiny pearls are ready to be brewed. With a pale liquor and delicate taste, Buddha’s tears provide a soul-soothing treat at any time of day. What a lovely jasmine tea! The ingredients confuse me just a little – this is a “pearl” jasmine tea, and so I don’t know where the white tea comes in to play, unless they are considering the bud attached to the two leaves the white tea. But, it hardly seems necessary to fuss over such details. These little “tears” unfurl slowly, releasing their intense flavor… which means many happy infusions for this jasmine enthusiast! The flavor is sweet and silky. Sometimes jasmine can come off as slightly bitter or soapy, but not this time. The jasmine simply tastes lightly floral. It is very soothing and restorative – and to get full effect of the relaxing effects of this tea I strongly recommend inhaling deeply – taking in the fragrance – before you sip. 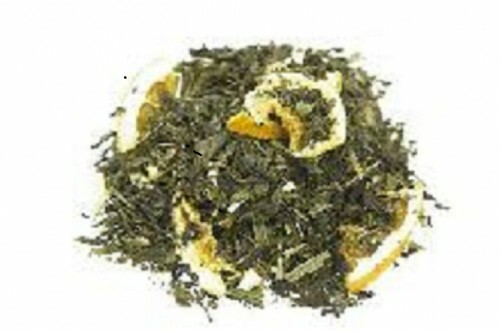 The green tea/white tea is delicate and very soft … like clean air and crisp spring leaves! It has a very comforting feel to it as it washes over the palate. A delightful tea any time of the day, I find it most welcome later in the afternoon to help calm frazzled nerves. I do not recommend sweetening this tea as it would overwhelm the gentle flavors of this tea. I prefer it hot, but it makes a nice iced tea as well (and when I ice jasmine tea, I do add a little sweetener just to perk up the flavors). 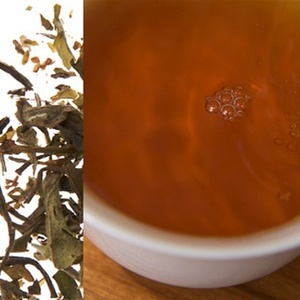 It is a refreshing and beautiful tea, no matter how you choose to serve it! Flavor Profile Delicately sweet with bright notes of mandarin, tangerine, and strawberry. Ingredients White Tea, Oatstraw, Schizandra Berry, Ginger, Safflower Petals, Strawberry, Natural Flavors. This is such a deliciously unique tea! The fragrance of the dry leaf is amazing – I can smell the citrus tones, a light amount of spice from the ginger, and the strawberry! Together, these scents create a mesmerizing aroma. The flavor is light and crisp. 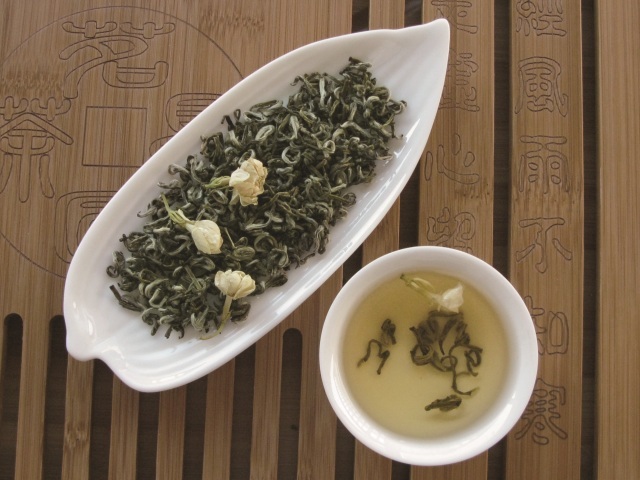 The white tea base has a delicate vegetative taste. It is clean and fresh. There is a soft, barely-there mouthfeel and a light astringency. The fruit flavors are nicely balanced and appeal to the palate with sweet, tangy and tart notes. The ginger is not overwhelming here and adds just a hint of zesty spice. I don’t remember having tasted oatstraw in a tea before, so I don’t know if I’m tasting it now or not, but, oatstraw is very beneficial to health and I’m glad it’s there! As I sip, I can feel the stresses of the day melt away. I can even feel the tension in my shoulders lighten a little! This is an amazing tea, and I’m glad I had the opportunity to try it. I absolutely LOVE this tea. The aroma is amazing! It smells sweet and fruity, somewhat floral and leafy, and reminds me of the air here in the Pacific Northwest just after it rains (which it does a lot here). The dry leaves are fuzzy and even though they resemble spears or “needles” – they are light and fluffy. Silvery! And the flavor they produce when steeped is so delightful. The flavor is delicate and sweet. I can taste peaches! Fresh, delicious peaches! The taste is crisp and slightly vegetative. Clean and invigorating! The mere act of sipping this tea is truly a meditative process. First, inhaling deeply to experience its sweet fragrance, and then taking a sip and allowing the flavors to develop onto the palate, all the while I can feel the stresses of the day disappear as my spirit rejuvenates. I love this tea! This is a tea I could drink every day and never grow weary of it.